I have 17 does to keep track of. Feeding fodder isn’t difficult, but once litters are involved, fodder amounts vary based on the amount of babies in the litter, the age of the litter, and the weight of the mother. 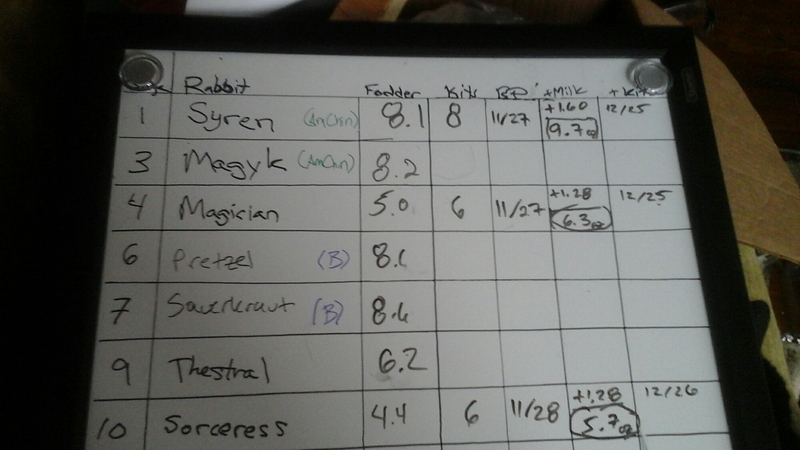 So, it was about time for me to actually write out a grid on the base level of fodder (which is 6% of rabbits weight), litter size (which determines the extra fodder for the milking doe), and after 4 Weeks of age, the supplemental feed for the weaned kits. I went based on a fodder chart from another rabbit raiser. I will let you all know how raising does on fodder goes….